Human beings are never satisfied with what they have. May it be any want or even “Body parts”. When the amount of dissatisfaction crosses its limits, you get to see some really shocking results. Here are some celebrities who got addicted to plastic surgeries and ended up looking worse than they looked before undergoing cosmetic treatments! 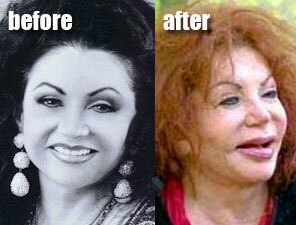 #1 Plastic surgery addict injects ‘cooking oil’ into her own face. Hang Mioku, a woman from Korea took her plastic surgery addiction to a whole new level, she tried some of her household methods and thought of injecting her face with cooking oil in the attempt to give her a ‘Botox’ effect. The woman is now permanently scarred for life on her face and hands. Another addict spent more than $4 million on her surgeries. 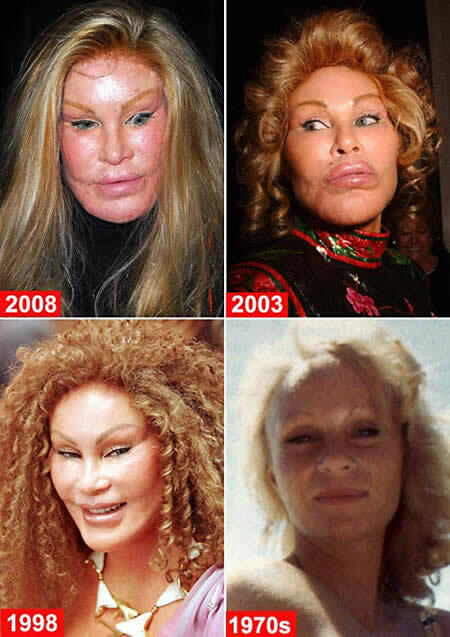 Jocelyn Wildenstein is known for changing her face completely with millions of dollars. But nothing happened worth spending such an enormous amount. She has been ridiculed and called by names like, Cat Woman and Lion Queen. 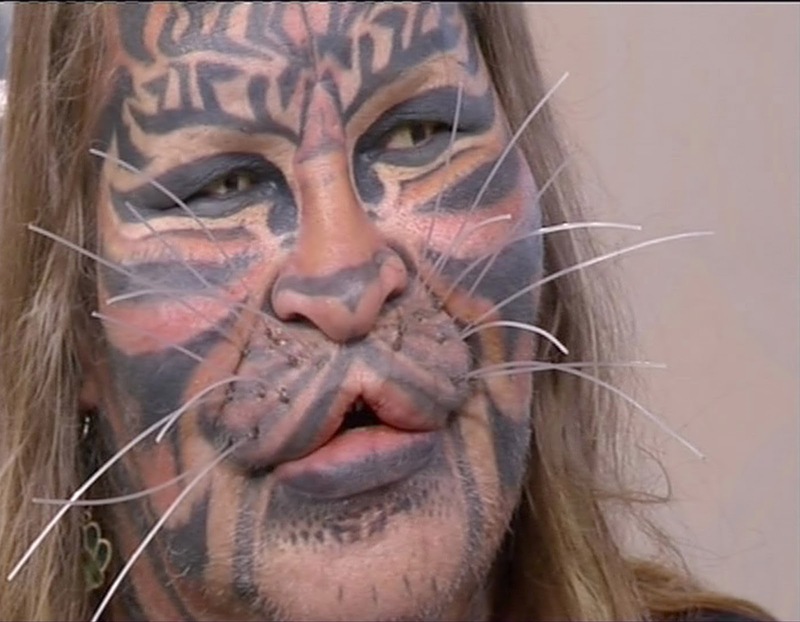 A man spent more than $ 200,000 on plastic surgery to make himself look like a tiger. His modifications included, Full body tattooing, facial implants, he got his ears shaped like a tiger and wore a robotic tail. 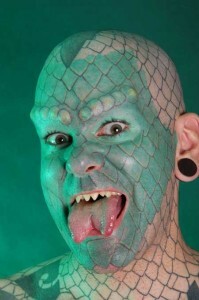 Eric Sprague, the Lizard man was one of the first people to have a split tongue. 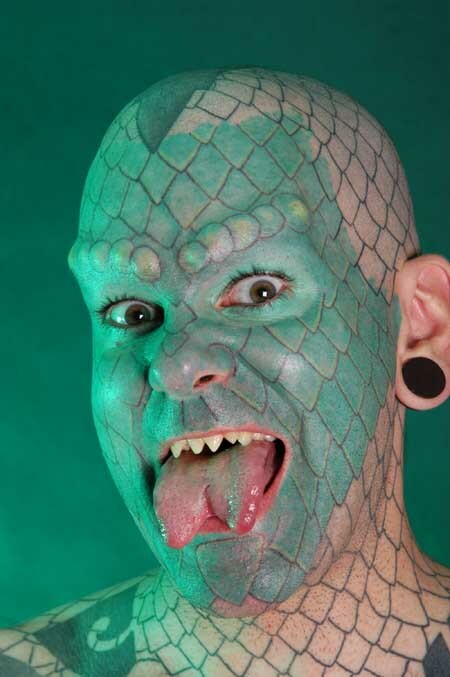 This 37 year old man has transformed himself into a reptile by 700 hours of tattooing and five teflon horns implanted beneath the skin of his eyebrows and his modifications include much more. The photograph shows Donatella Versace before and after. Famous fashion designer Donatella has gone through drastic changes and ended up turning herself into a caricature. The mother of famous actor Sylvester Stallone, is now relatively famous for her too much plastic surgery, as she has tried everything which can be done with the human face, such as facelift, eyebrow lift, cheek implants, nose job and lip jobs. The scenarios of these celebrities above have made it very clear that, anything in excess is always harmful!